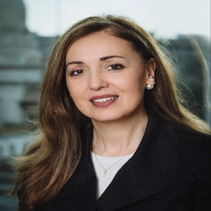 Recently appointed as Country manager Resident representative of the African Development Bank in Morocco, Leila Farah Mokaddem was the Resident Representative of the AfDB in Egypt from 2014 to 2017. Prior to that, she occupied the positions of Regional Resident Representative in Dakar, Senegal, and head of financial institutions where she designed innovative financial solutions for Africa including for SMEs’ guarantees, trade finance and women in business economic empowerment. Prior to AfDB, Leila was long-term fiscal advisor to the IMF. She started her carrier at the Ministry Economy of Tunisia and has MBA degree in Finance and International trade, respectively. Leila is sitting at the Board of the Afreximbank.